Department of Family Medicine, University of Marburg, Germany. Background Headache is one of the most common symptoms in primary care. Most headaches are due to primary headaches and many headache sufferers do not receive a specific diagnosis. There is still a gap in research on how GPs diagnose and treat patients with headache. Aim To identify GPs’ diagnostic approaches in patients presenting with headache. Design and setting Qualitative study with 15 GPs in urban and rural practices. Method Interviews (20–40 minutes) were conducted using a semi-structured interview guideline. GPs described their individual diagnostic strategies by means of patients presenting with headache that they had prospectively identified during the previous 4 weeks. Interviews were taped and transcribed verbatim. Qualitative analysis was conducted by two independent raters. Results Regarding GPs’ general diagnostic approach to patients with headache, four broad themes emerged during the interviews: ‘knowing the patient and their background’, ‘first impression during consultation’, ‘intuition and personal experience’ and ‘application of the test of time’. Four further themes were identified regarding the management of diagnostic uncertainty: ‘identification of red flags’, ‘use of the familiarity heuristic’, ‘therapeutic trial’, and ‘triggers for patient referral’. Conclusion GPs apply different strategies in the early diagnostic phase when managing patients with headache. Identification of potential adverse outcomes accompanied by other strategies for handling uncertainty seem to be more important than an exact diagnosis. Established guidelines do not play a role in the diagnostic workup. A qualitative research approach was used to address the study question and to gain a deeper insight into GPs’ unique experiences, strategies, heuristics, and interpretations of their findings when dealing with patients with headache.13 Single interviews were chosen as the most appropriate technique for data collection, as it created the best environment to talk to each GP about their own individual diagnostic strategies. Fifteen GPs in the federal states of Hessen, Bavaria and North Rhine Westphalia (Germany) were approached. GPs were recruited via personal contacts and among GPs affiliated with the University department. GPs were contacted in advance, given an explanation of the aim of the study and they gave written permission for inclusion in the study. A flexible interview guide was designed based on recent literature on headache in primary care. It was explained to the GPs that the study was about understanding how they managed patients with headache, and what role intuition, clinical experience, and diagnostic uncertainty played in their daily routine with these patients. To elucidate their diagnostic approaches, the participating GPs were asked to collect information on every patient presenting with headache in their practice during the following 4 weeks. After these 4 weeks a second appointment for the interview was arranged. The collected patient data were exclusively used by the GPs to aid recall during the interview (‘stimulated recall’),15 but were not presented to the interviewer. GPs use a broad range of diagnostic strategies in the workup of patients with headache. GPs found it more important to have effective strategies for handling uncertainty than to make an exact diagnosis. The semi-structured interview began with a question about the overall number of patients and the diagnoses collected by the respective GP. Afterwards, GPs were invited to recall the consultation of these patients. A semi-structured interview guideline was used to cover all relevant topics (history taking, examination and further diagnostic investigations, identification of red flags, GPs diagnostic strategies and individual heuristics, and dealing with uncertainty). Participants were asked about central aspects of clinical history and physical examination, the use of scores or any other (also individual) algorithms that helped GPs in the differential diagnosis of their specific cases. Additionally, the authors were interested in determining what GPs thought about the role of intuition and gut feeling. GPs’ reflections on their diagnostic reasoning or individual diagnostic strategies concluded the interview. Interviews were arranged at the GPs’ convenience and lasted between 20–40 minutes each. Interviews were taped and transcribed verbatim. To assist data handling, the material was transcribed and analysed using MAXQDA-10. A content analytic approach was applied and, based on the interview guideline, a coding system (coding tree) was deductively developed as a first step. The coding tree and coding were tested and refined within the study qualitative working group. All interviews were coded by two independent raters; differences in coding were resolved by discussion. In an iterative process inductively derived new codes and themes were added to the coding tree. Emerging concepts and themes were repeatedly discussed and refined by all authors in regular meetings. In summary, this analysis can be categorised as a thematic survey, executed stepwise, with each step informing the next.16,17 Interviews were conducted in the German language, translated into English, and crosschecked by a native speaker for both languages. Nineteen GPs from urban and rural areas were approached and four declined participation. Table 1 shows the characteristics of the 15 interviewed GPs. Regarding the general diagnostic approach to patients with headache, four broad themes emerged during the interviews. Almost all GPs considered this process of watchful waiting not as careless, but on the contrary as more sensible and appropriate than immediately starting with further extensive diagnostic procedures. When asking GPs how they manage diagnostic uncertainty, four further themes emerged. 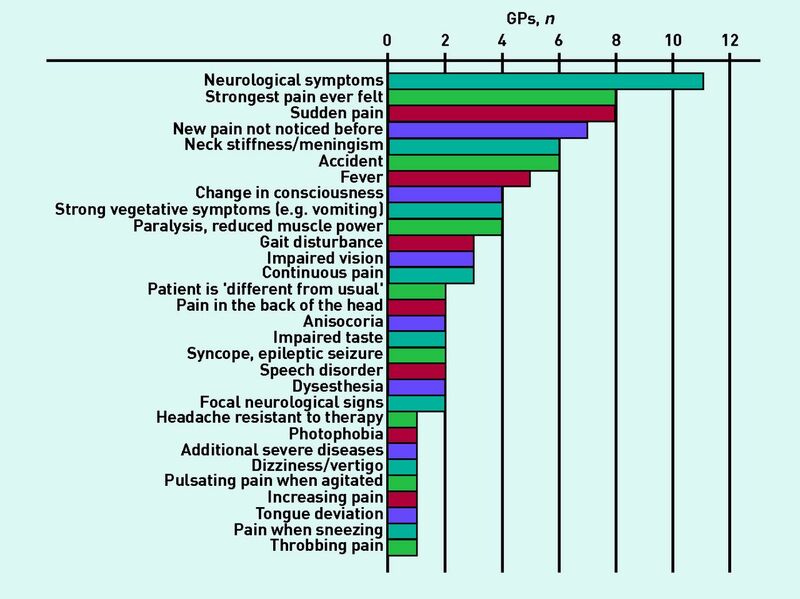 Figure 1 shows a summary of the different red flags mentioned by the interviewed GPs. Different red flags for headache mentioned by GPs. Figure 2 summarises the different approaches applied by GPs to use therapy for diagnostic purposes. GPs’ approaches to use of therapy for diagnostic purposes in patients presenting with headache. The first row shows the different strategies applied by GPs; the arrows indicate whether the patient shows a positive or negative response to it. Boxes in the second row show the resulting diagnostic conclusions of the next steps taken by GPs. Figure 3 summarises different quotes made by the interviewees with regard to indications for specialist referral. Indications for specialist referral in patients with headache. GPs’ diagnostic management of patients presenting with headache were identified. In the general diagnostic workup, a long-term relationship with the patient and their family, along with the first impression gained during consultation combined with intuition and the GPs’ personal experience, all played important roles. GPs also frequently used the test of time. GPs reduced diagnostic uncertainty by early identification of red flags, usage of the familiarity heuristic or a therapeutic trial and by identifying triggers for patient referral. The data presented have limitations; for example, another way to capture doctors’ diagnostic reasoning, such as videotaped interviews, may have more internal validity, however, this method is difficult to implement in a primary care setting. Using standardised patients would have been a possible alternative. Although feasible, this approach would not have captured the diagnostic significance of long-term relationships between GPs and their patients, and the GPs reasoning about the chosen diagnostic approach. The current study was conducted in German and the transcript translation into English may have resulted in some distortion of the original meaning. In an attempt to minimise this effect, the manuscript was corrected by a native English speaker with a medical background. Finally, these findings relate to the specific context of the German health system, which has high patient contact rates with both GPs and specialists, and lacks specific guidelines for the diagnosis and management of headache in primary care. The strength of this study lies in the prospective identification of patients used in the interview, which allowed examination of the diagnostic process in a defined clinical situation. However, it is not possible to rule out that GPs reinterpreted their diagnostic arguments afterwards or tried to change first intuitional diagnostic hypotheses into more rational thoughts during the interview. This kind of bias was minimised by encouraging GPs to give their very own individual accounts of diagnostic methods and strategies, stressing the lack of primary care research in this area to create an atmosphere of open and self-critical reflection. The study sample is largely representative of general practice in Germany. GPs additionally stressed the role of intuition and personal experience. Stolper et al confirm the important role of gut feelings together with analytical reasoning and personal experience in GPs’ diagnostic reasoning.20 The initial steps of the diagnostic process are often non-analytical or intuitive24 before, in a further step, one or several hypotheses are generated.25 This process is reflected in these data. Most GPs used a therapeutic trial in certain patients. A positive response was judged as an indicator for primary headache and reduced diagnostic uncertainty. The test of treatment is a well-established principle in primary care,27 although spontaneous patient recovery and placebo effects can lead to bias.32 While tension-type headache normally does not respond to triptans,33 a response to individual triptans in patients with migraine is idiosyncratic,28 and a negative treatment result can therefore be misleading. In addition, the test of treatment approach could trigger the continued use of over-the-counter drugs and could go along with a higher risk of medication-overuse headache. This study’s findings underline the need for further guidance in the workup of patients with headache. This may be in the form of effective strategies for handling uncertainty including guidance on specialist referral or the development of simple guidelines that allow making an exact diagnosis in the specific context of primary care. In conclusion, GPs use a broad range of strategies to manage patients with headache. Effective strategies for handling uncertainty are more important than an exact diagnosis. Established guidelines do not play a role in the diagnostic workup. We thank all the participating GPs for their cooperation. The study protocol was approved by the Ethics Committee of the Faculty of Medicine, University of Marburg (AZ 192/09). Revision requested June 12, 2014. (1972) Symptom interpretation in general practice. J R Coll Gen Pract 22(118):297–309. (2006) Headache and migraine in primary care: consultation, prescription, and referral rates in a large population. J Neurol Neurosurg Psychiatry 77(3):385–387. (2007) Top 10 differential diagnoses in family medicine: headache. Can Fam Physician 53(10):1733. (1993) Quality of life and well-being of patients with headache: measurement by the medical outcomes study instrument [abstract] Headache 33(7):351–358. (2013) The International Classification of Headache Disorders. Cephalalgia 33(9):629–808, 3rd ed (beta version). (2005) Presentations of headache in Australian general practice. Aust Fam Physician 34(8):618–619. (2002) Headache in primary care: how important is diagnosis to management? Br J Gen Pract 52(480):569–573. (1997) Guidelines for the diagnosis and management of migraine in clinical practice. Canadian Headache Society. CMAJ 156(9):1273–1287. (2005) Recognition and management of migraine in primary care: influence of functional impact measured by the headache impact test (HIT) Cephalalgia 25(3):184–190. (2008) Headache diagnosis, management and morbidity in the Singapore primary care setting: findings from a general practice survey. Singapore Med J 49(10):774–779. 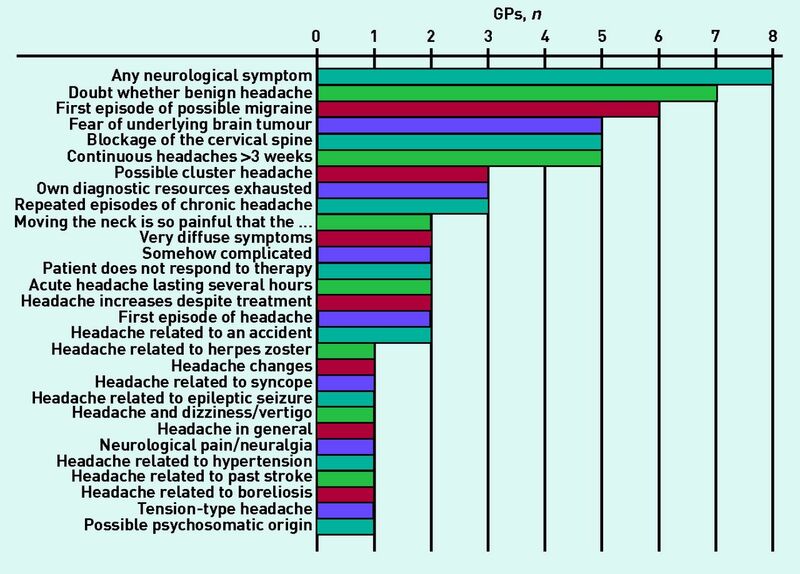 (2008) GPs’ classification of headache: is primary headache underdiagnosed? Br J Gen Pract 58(547):102–104. (2003) ‘I saw a great star, most splendid and beautiful’: headache in primary care. Br J Gen Pract 53(488):182–184. (2002) Research into headache: the contribution of qualitative methods. Headache 42(10):1051–1059. (2014) Diagnostische Strategien bei Patienten Diagnostische Strategien bei Patienten mit Kopfschmerz in der Hausarztpraxis — eine qualitative Untersuchung [Diagnostic strategies in headache patients seen in primary care — a qualitative study] Z Allg Med 90(7):36–42. (1978) Medical problem solving: an analysis of clinical reasoning (Harvard University Press, Cambridge, MA). (2003) Classifying the findings in qualitative studies. Qual Health Res 13(7):905–923. (2010) Einführung in die computergestützte Analyse qualitativer Daten (VS, Verl. für Sozialwiss, Wiesbaden) [Introduction in computer aided analysis of qualitative data] 3rd ed. (1999) Wie stellt der Allgemeinarzt eine Diagnose? [How does the general practitioner make a diagnosis?] Z Allg Med 75:744–749. (2008) ‘This is not normal …‘ — signs that make the GP question the child’s well-being. Fam Pract 25(3):146–153. (2011) Gut feelings as a third track in general practitioners’ diagnostic reasoning. J Gen Intern Med 26(2):197–203. (1982) Patient characteristics that influence physician behavior. Med Care 20(6):630–638. (1984) Perceived likeability and competence of simulated patients: influence on physicians’ management plans. Soc Sci Med 18(12):1053–1059. (2008) Machen Hausärzte Unterschiede, wenn sie mit Kopfschmerzpatienten umgehen? Eine Querschnittsstudie mit ängstlich oder neutral gespielten standardisierten Patienten [Variation in General practitioners’ performance towards patients with acute headache] Z Allg Med 84(07):273–279. (2007) Non-analytical models of clinical reasoning: the role of experience. Med Educ 41(12):1140–1145. (2009) Iterative diagnosis. BMJ 339:b3490. (2013) The time-efficiency principle: time as the key diagnostic strategy in primary care. Fam Pract 30(4):386–389. (2008) Diagnosis and management of headache in adults: a national clinical guide, Scottish Intercollegiate Guidelines Network (Scottish Intercollegiate Guidelines Network, Edinburgh). (2002) Asking for ‘rules of thumb’: a way to discover tacit knowledge in general practice. Fam Pract 19(6):617–622. (2002) Diagnosis and treatment of migraine. Mayo Clin Proc 77(3):255–261. (1999) Pathways from symptoms to medical care: a descriptive study of symptom development and obstacles to early diagnosis in brain tumour patients. Fam Pract 16(2):143–148. (2009) Diagnosis using ‘test of treatment’ BMJ 338:b1312. (2009) Review: Drug and nondrug treatment in tension-type headache. Ther Adv Neurol Disord 2(3):155–161.